These savory baked tomatoes are a wonderful vegetable side dish recipe that you will serve over and over again. The topping mixture is delicious. It is a mix of bread crumbs, cheese and basil with a few red pepper flakes for a bit of heat and even more flavor. Brush the cut surface of the tomato halves with olive oil. Sprinkle the tomatoes with salt. Place the tomato halves in a 13x9x2 inch baking dish. Combine the rest of the ingredients in a small bowl and mix well. Spoon the mixture over the cut surface of the tomatoes, piling it a bit to help it to stay on. Bake at 350°F for about 15 minutes. They are done when the tomatoes are thoroughly heated through and the cheese is melted. Replace the cheddar cheese with mozzarella for an Italian twist. Use green tomatoes at the end of tomato season for a bit of different flavor. I suggest using nice round tomatoes for this recipe. They have a good amount of juice, which will give you wonderful flavor and the cut surface is large and will hold lots of this fantastic topping. If you use Roma style tomatoes, those long tomatoes that are perfect for Italian cooking, choose nice plump tomatoes and slice them lengthwise. That way they will lay flat and hold the topping nicely. Tomato recipes are so healthy for us. Tomatoes are rich in lycopene. They are also a source of chromium, fiber, folate and other health giving nutrients. You can read more about the amazing properties and facts about tomatoes here. Adding the fresh chopped parsley at the end not only makes the tomatoes look even prettier on the plate, it also adds more nutrition to the dish. These tomatoes are nice and juicy after they are baked so they are a great accompaniment to meat dishes that are grilled or roasted. This is a great diabetes recipe. It has a bit of bread crumbs, but is still fairly low in carbohydrates. 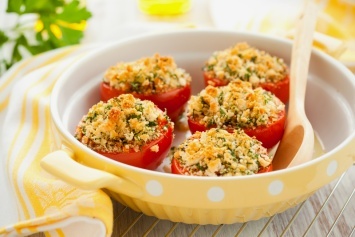 These delicious baked tomatoes are just one of our fabulous vegetable recipes. Browse them here.